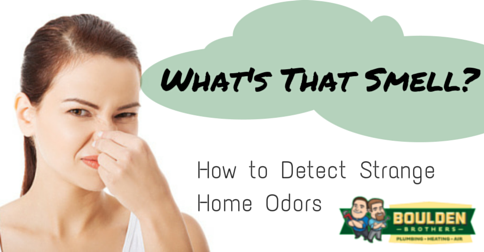 If you are there are strange smells in or around your home, you may have a bigger problem than just the unpleasant stench. It is best have a full-service plumbing, HVAC, and electric company investigate the situation as soon as possible, as you could be in considerable danger. If you smell animal waste, dander, cat boxes, or any other pet smells, that’s probably what it is (either prior or current pets in the building); however, if the smell if a noxious sickly smell, most likely you have an insect nest or dead animal(s) somewhere in your plumbing or duct system. We have found dead possums, rats, snakes, cats, raccoons, and insect nests that have made their way into the ductwork, or the air handler itself. Trust your instincts with this one: if you smell a dead animal, it probably is one. Sometimes, people think they are smelling sewage, but regardless, it will be strong and noticeable. Call a professional AC repair or plumbing repair company to take a look at your plumbing and duct system and get this taken care of as soon as possible! Unless it is fish, this strange smell is probably emanating from a burning electrical component. Electrical shielding, wires, and other plastic components emit a “fish” or “urine” smell when exposed to high heat. If you smell something fishy, go around your home and look for outlets and other electrical equipment that looks burnt or melting. Also, make sure that plastic and anything else that could burn is far away from any heat source, including light fixtures. If there is a sewer smell in your home, this might be caused by a dried up P-trap. P-traps are there so that water gets trapped, creating an air block for any sewer gases that might rise up. If, however, you have not used your drain in a while, the water in your P-trap could evaporate, clearing the way for noxious sewer gases to infiltrate your home. Water should be run in all of your drains at least once a month to prevent this from happening! If you smell a musty or mold odor, it is probably there. Go around your house and check for any water leaks, damp items, and moisture to find the source of the problem. Mold varies in severity from being merely cosmetic to dangerously toxic. For small areas of mold, consult this mold inspection and cleanup guide. If, however, the problem is larger than you can handle, give Boulden Brothers a call. You may need to recaulk your plumbing fixtures to prevent water from entering the area between the fixture and the wall, which could cause water damage and foster mildew and mold growth. You may also need better ventilation, especially in areas of high moisture like your basement, bathrooms, and kitchen. Another way to control mold growth is to have a whole-house humidification system connected with your HVAC unit to maintain safe levels of humidity in the home. In the winter, the air gets dangerously dry, contributing to illness and colds more than anything else, while in the summer, the air can get very moist, providing the perfect environment for colonies of mildew and mold. The smell of rotten eggs is a tell-tale sign that you have a gas leak or a problem with your plumbing. The smell of sewage is often compared with the smell of rotten eggs. The first thing you should check is if the smell is coming from your drains or when you turn on the water. You may have a dried out P-trap or water seal in a floor drain or the problem could exist in your home’s sewage tank or the plumbing water pipes. Depending upon the situation, the solution could be simple or complicated. If you notice the smell more when you have the hot water running, then the problem probably lies in your water heater. You may have to replace the sacrificial anode rod, which needs to be replace every 5 years or so. 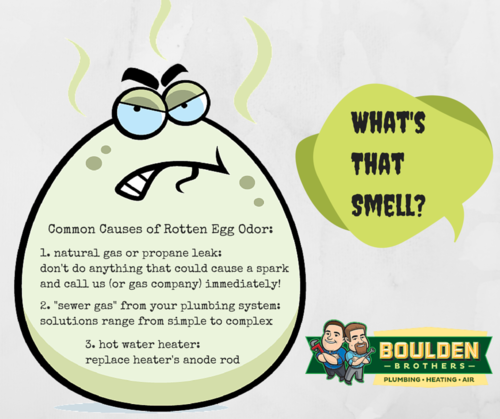 The other, more dangerous, cause of a rotten egg smell in the home is a gas leak. Manufacturers add a chemical to natural gas and propane to give it a distinctive odor, as they are naturally colorless and odorless. This smell is actually a safety precaution and it is supposed to bother you. If you smell rotten eggs, you should call your trusted Plumbing and HVAC company right away. 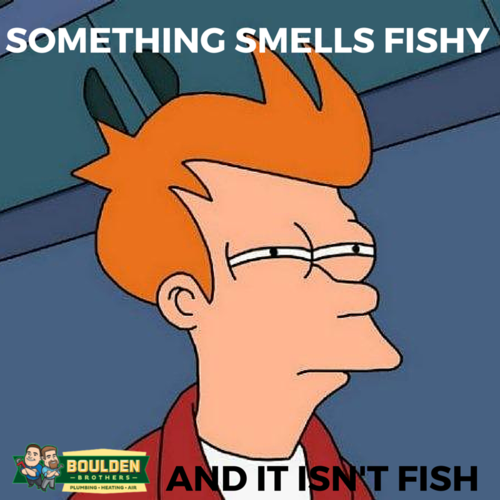 Boulden Brothers will dispatch an expert technician to inspect your home and pinpoint the exact source of the strange smell. If you have any questions about strange smells in your home or safety prevention, call the experts at Boulden Brothers Home Service at (302) 368-3848. We also offer furnace repair, water heater installation, electrician services, and more. We are available 24 hours a day, 7 days a week to answer any questions you might have. To contact us, you can fill out an online form or send us a message on Facebook and Twitter. Check Out Our HVAC Troubleshooter!